The Declasse Tornado Rat Rod is now available in GTA 5 Online. In the video below shows there are tuning possibilities and the crisp sound of this hot sleigh. The new Bikers update for GTA 5 Online has already brought many cool vehicles into the game. Among them are mostly motorcycles. However, the latest Bikers expansion has 4 bikes and will be responsible for a lot of smoke on the streets of Los Santos. 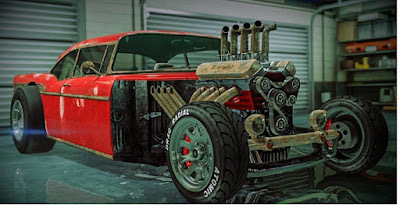 The Rat Rod is now available in GTA 5 Online and can be purchased from Southern San Andreas Super Autos. The car costs in the normal state 378,000 GTA $ and is thus not exactly favorable. If you want to give the car a personal touch after the purchase, you have to take it to a workshop. In the video you can see a selection of the different ways to modify the Declasse Tornado Rat Rod. The premium race this week is called City Air (Cunning Stunts) and is available from 1 November to 7 November. The race takes place high over Los Santos and brings a decent adrenaline rush when you fly with your cars through the air. If you are still looking for a suitable car, you can take advantage of the current discounts by November 7th. For the anniversary of GTA Online, Rockstar offers you huge discounts on a wide range of cars or weapons. With 30% discount on these popular vehicles and weapons, you are able to expand your collection and secure a classic car in the garage.